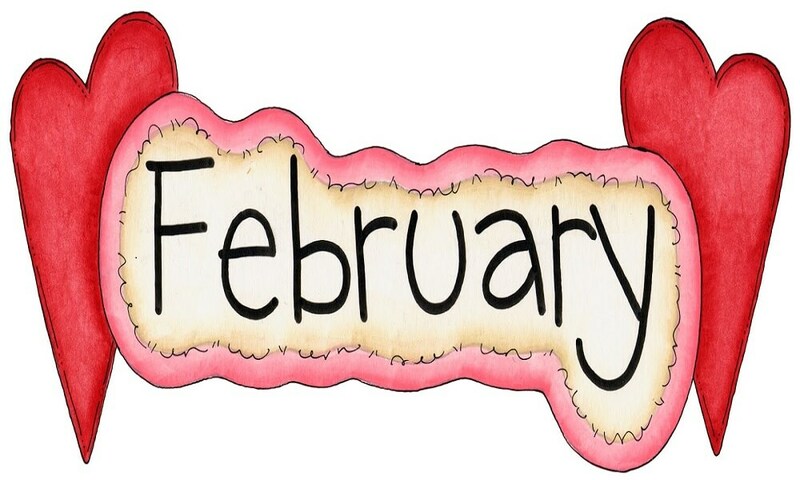 February, the shortest month of the year, is special for various reasons. Yes, we know it’s still a bit cold in the month, and spring seems ages away, but it still has several good stuff that makes us love this month. Firstly, kids can get their hands on the delicious Crème Eggs, even though Easter comes in April. Secondly, we have the Mardi Gras festival, which actually originated in Brazil, but is celebrated all over the world. And thirdly, Valentine’s Day, the day of love, falls in February. There are many other beautiful things about this month, which we will celebrate in our collection of free printable February coloring pages. So check out the list of February coloring sheets below! This coloring page shows a young girl preparing a craft for her friend, mother or father on the occasion of Valentine’s Day. We must say the heart cut out is looking very neat and would look amazing when used as a card. 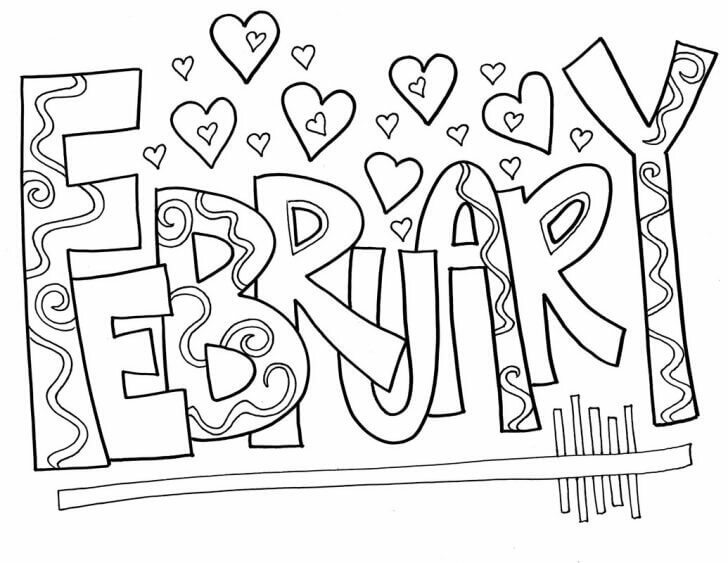 Nothing could portray the month of February more beautifully than this coloring page. The reindeer is warmed up in a muffler, and the birds are carrying love letters of people. Everything looks surreal and beautiful in this February coloring sheet. This is one of the most beautiful February coloring pages in our opinion. It features the word February in a lovely font. What makes this coloring page part is the beautiful motifs used to decorate the font. 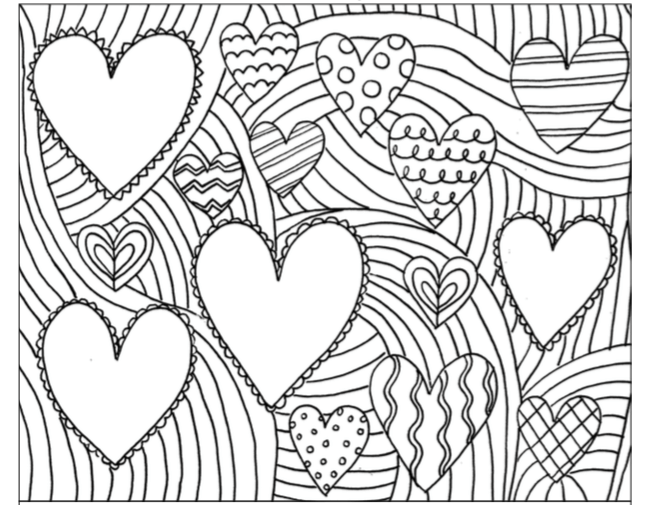 Hearts are literally overflowing in this coloring page. 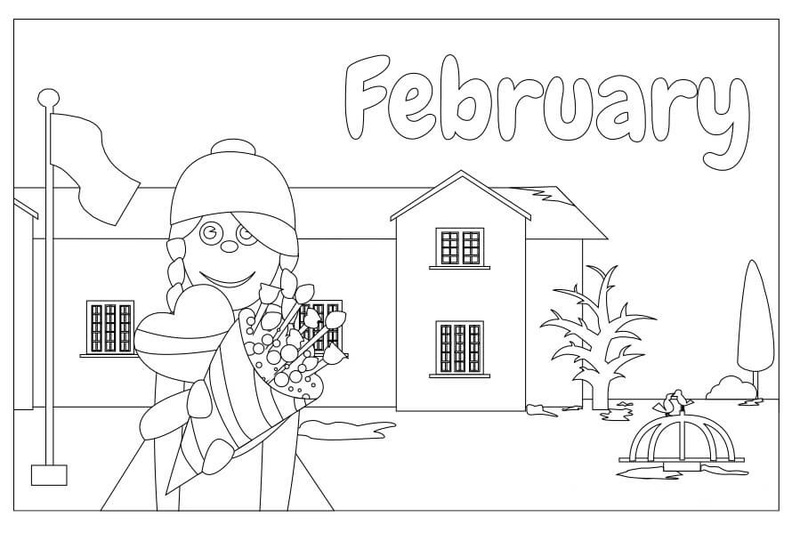 This coloring page shows a little girl thanking God for February. Below are some columns, which kids can use to fill with everything that happened in February. February is the month of love, where people share gifts with people who are closest to their hearts. Chocolates are considered the best and safest gift. 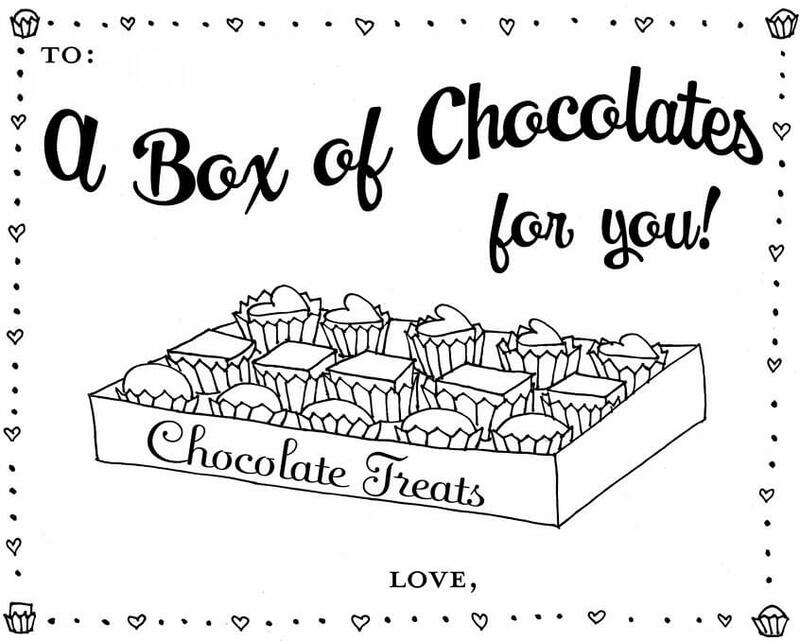 Even if you can’t give them real chocolates, you can at least color, print out and gift this chocolate coloring page to them. 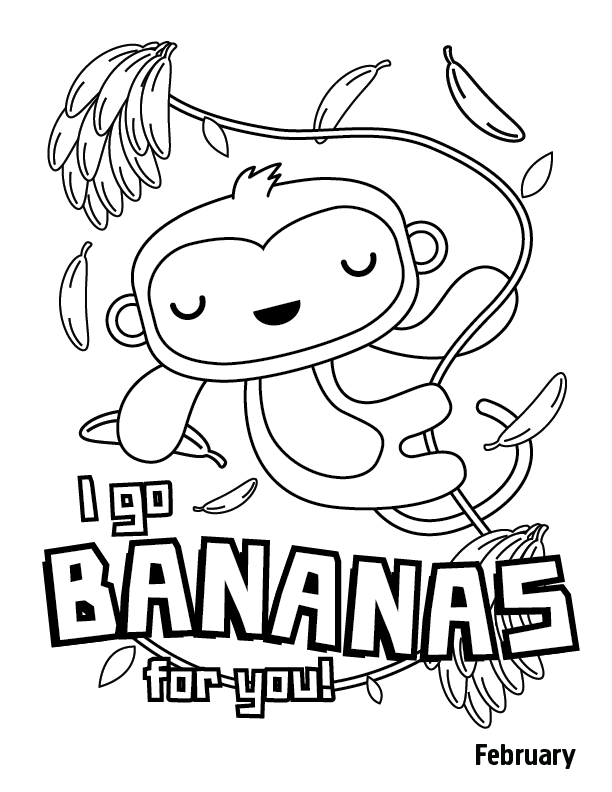 If you also go bananas for someone, no better way to let them know than by making a card out of this coloring sheet and presenting it to them. It’s totally up to you how colorful you want to make this card. February also happens to host the birthday of the most beloved President of America, Abraham Lincoln. We will never forget Abraham Lincoln for his contribution to the Civil War, perhaps the bloodiest war of all time. 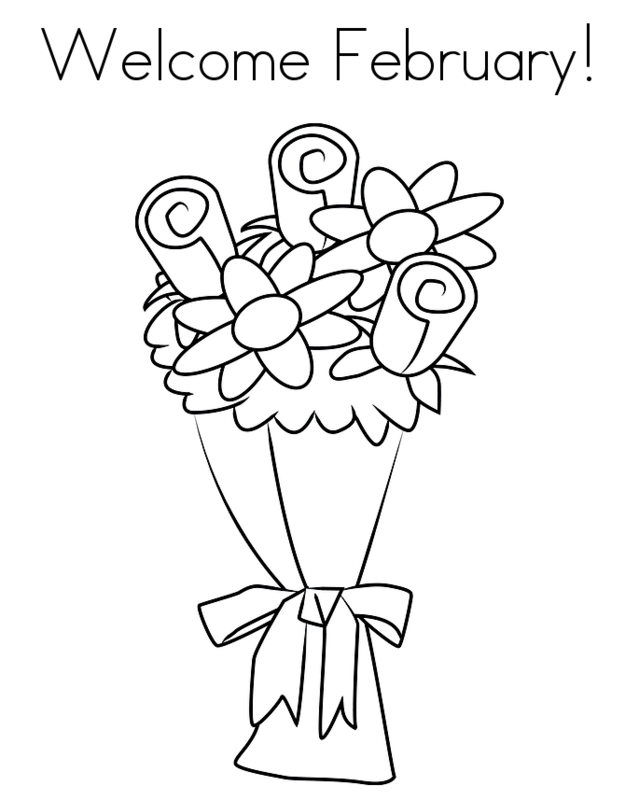 Welcome February with this cute bouquet coloring page. This bouquet contains roses and some other flowers. How would you like to color these flowers? We’d suggest you to give a multicolor hue to this bouquet. This way, it will stand out. 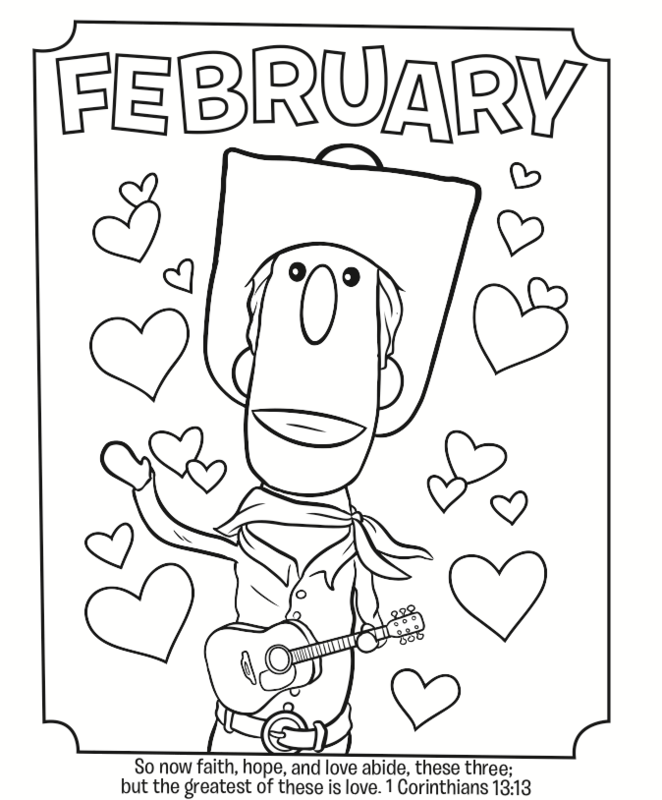 This coloring page shows Woody from Toy Story welcoming February in the most grandiose way, which is by playing guitar and making music. His music has definitely hit the right notes, as exemplified by the hearts surrounding it. 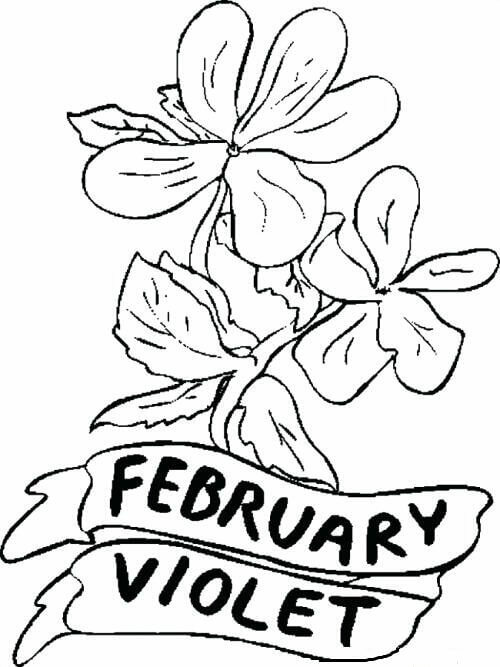 Here’s a coloring page of beautiful violet, the birth flower of the month of February. This beautiful flower symbolizes truth and loyalty, both being pillars of love and relationship. Use pretty purple color for this image. This hearts coloring page is definitely a lot different from what we generally get to see. It looks more like a henna design to us, with such beautiful detailing. And since it’s quite fine-lined, we’d suggest teens or tweens to try their hands at coloring this image. 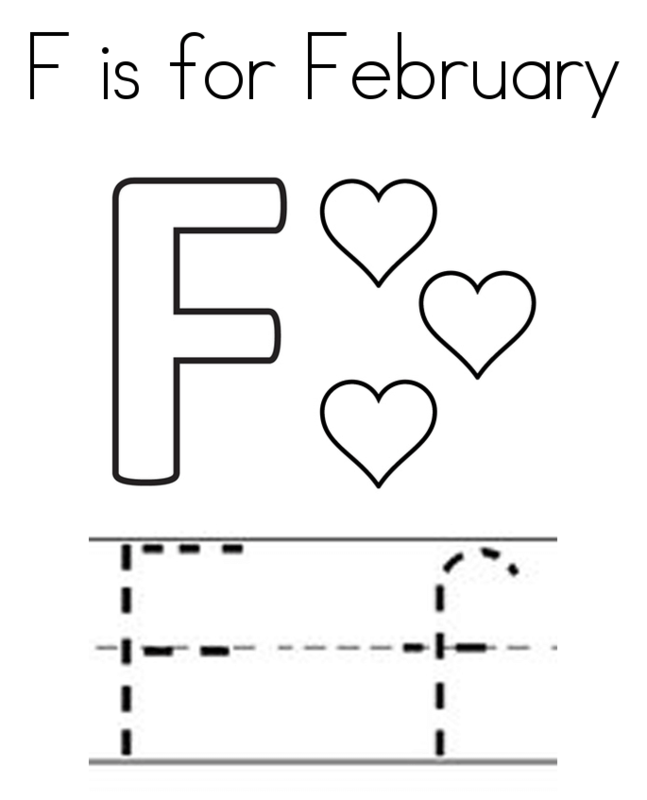 Teach your preschoolers to learn writing the letter F in both upper and lower case with this F for February coloring sheet. It doesn’t just feature the letter F in all its forms, but also tiny hearts, which you can fill. Here’s another worksheet to help your preschooler or kindergartner learn to write. 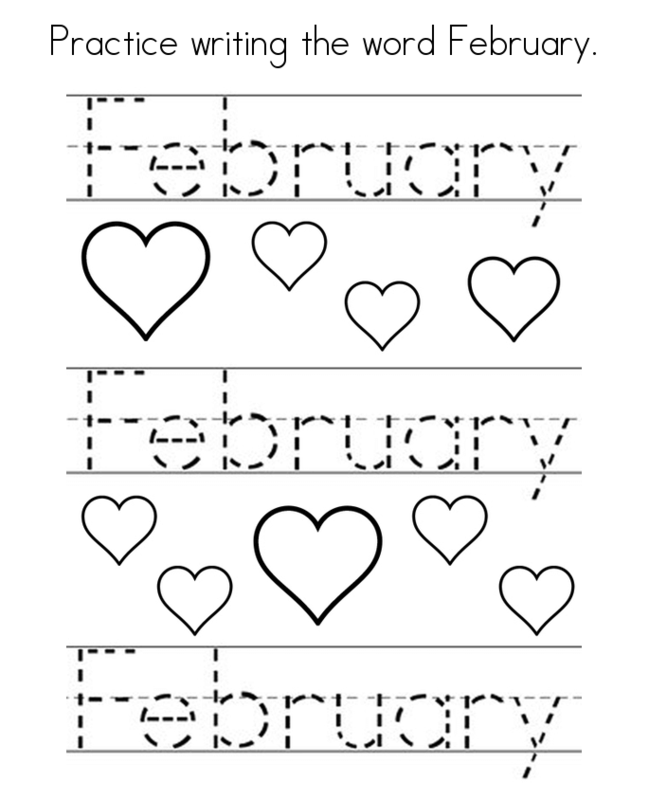 Children need to learn writing February by tracing along the dotted lines. They can even fill the hearts with any color they like. Here’s another wonderful February activity sheet with a cute image of a boy giving a Valentine’s day gift to his best friend or beloved. Children can write down their daily routine in the block featured below. 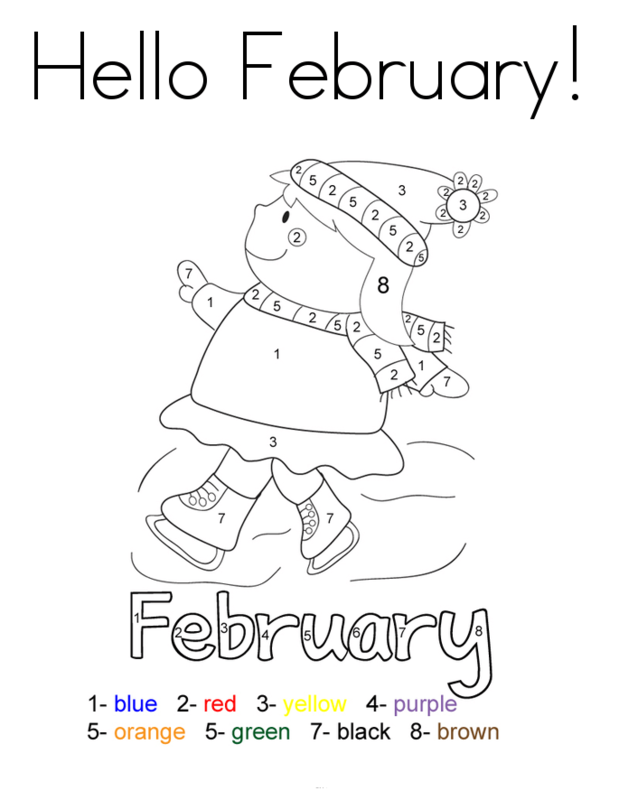 This is a pretty unique coloring page, where children have to follow the color guide for filling shades in the word February. 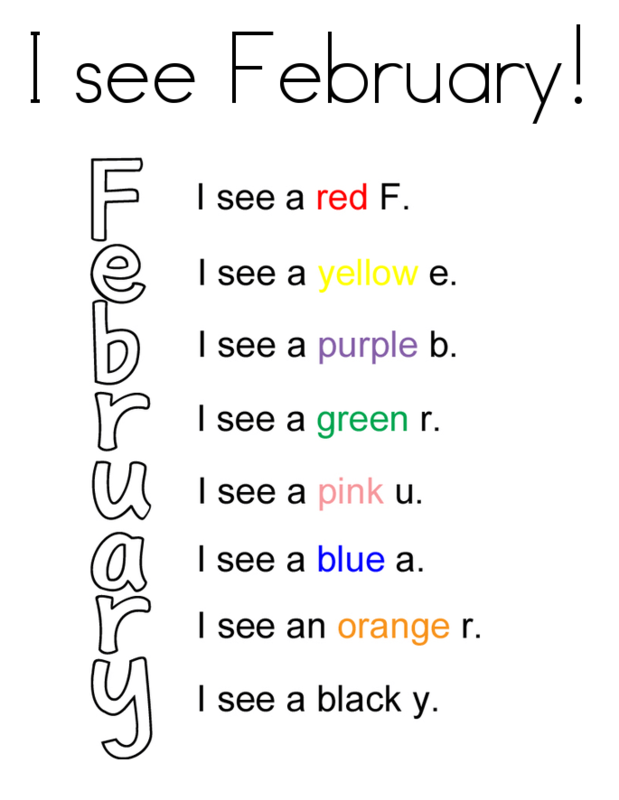 You have to make your child read the sentence beside each letter and color accordingly. February also happens to host Groundhog Day, the day when groundhogs decide whether winter will stay for a few more days or will the spring arrive early. This coloring page features a cute and chubby groundhog holding the February calendar. 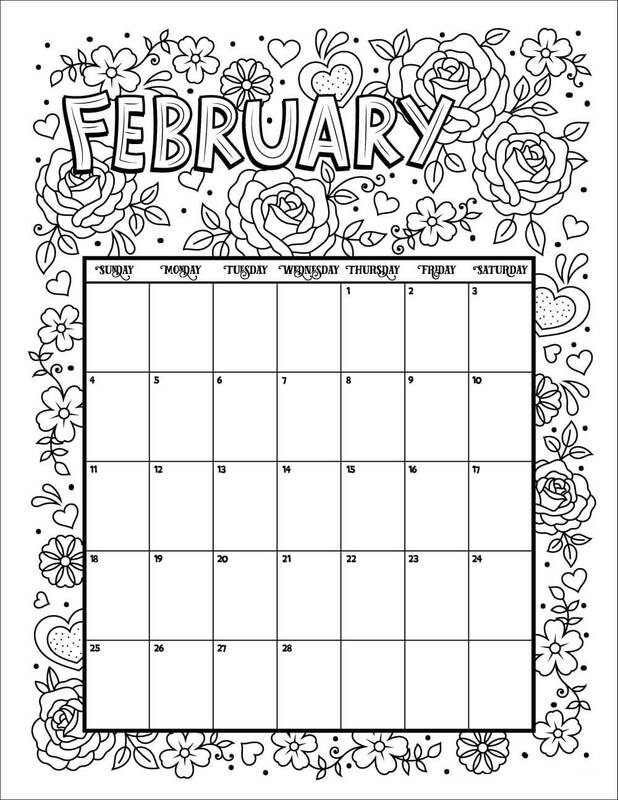 Welcome February with this cheerful color by number coloring page. You will find the color guide below, so ensure that you follow it, if you want to create a masterpiece. This coloring page shows a young girl with a flower bouquet and a box of chocolates. It’s probably Valentine’s Day and she has got these gifts from her friends. The background is about the school. This is a wonderful coloring page, which is the wordplay of the common phrase, “Be Mine”. A trio of bees has made a heart from the beeswax. Isn’t that cute? 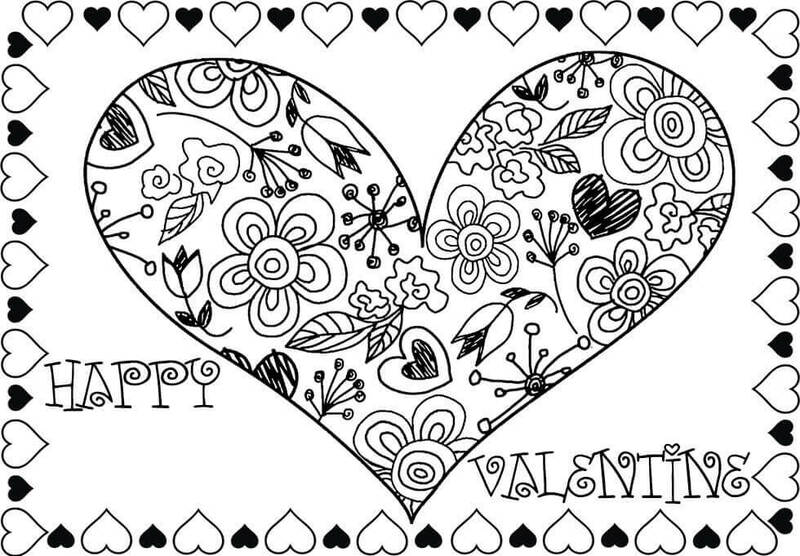 This beautiful February coloring page, feature an intricate Valentine heart, which even adults will enjoy coloring. 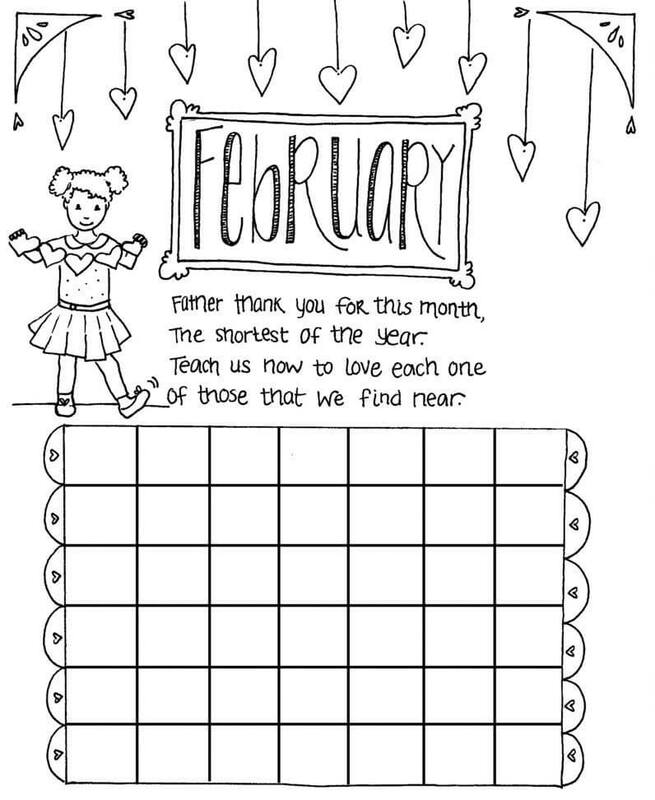 We hope you enjoy filling these free printable February coloring pages. We’d be including more of months and seasons coloring pages in the near future. So stay tuned with us. Until then, enjoy filling these February coloring sheets.